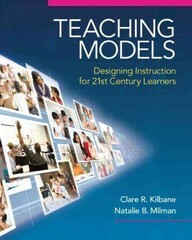 Teaching Models 1 Edition This new book provides educators with practical help for using a myriad of available digital tools to transform time-tested models of teaching in order to make 21st century learning more efficient, effective, and engaging. The authors focus on helping educators design effective instruction that successfully addresses the individual and shared learning needs of the diverse population of students in today’s dynamic, fast-paced, technology-driven, global society. In it the authors show when and how to use the unprecendented variety of powerful teaching resources available, and how to coordinate their use to best prepare students for the education and workforce demands in their futures.